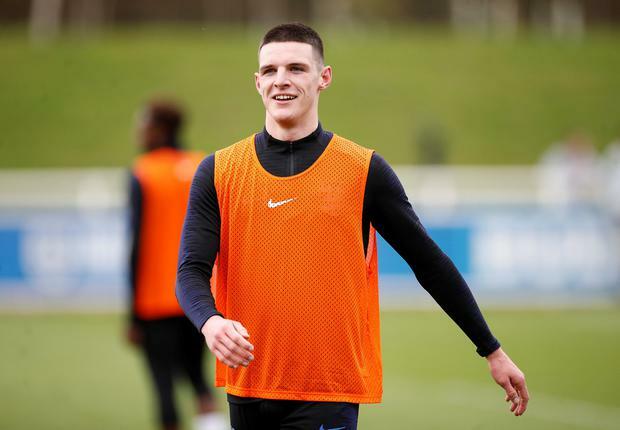 West Ham midfielder Declan Rice is determined to look forward after earning a first England call-up, which had him "bursting with pride" and feeling better from illness. The 20-year-old was named in Gareth Southgate's squad for the Euro 2020 qualifiers after being granted FIFA clearance to switch international allegiance from the Republic of Ireland. Rice had appeared for the Republic of Ireland's youth teams and also won three senior caps, but they were all in friendlies, which meant he was clear for a change of representation. Rice, who was last week named Ireland's Young Player of the Year, will take whatever opportunity he is given to impress following what had been a drawn-out international transfer. "You can't describe it. I just couldn't believe it," Rice said in an interview with the English Football Association, broadcast via social media channels yesterday evening. "I was ill the day last week that the squad got announced. My dad came home and we were watching the TV and it came up that I was in the squad. "I was just bursting with pride. It's everything that you've wanted to work for as a kid and it has come true. The call-up is one of the best feelings you're ever going to feel." Southgate maintains Rice's club form warranted his first England call-up, but offered no guarantees to the Hammers player. "It was a really tough decision. I think everyone knows my situation with the Republic of Ireland. I've played there in the youth setup, but I had to make a decision that was best for me," Rice said. "As you can hear, I am English, I am from England and it was really good playing for Ireland. "Now I'm just really looking forward to the future and pulling on the England shirt. I've just got to look forward and forget about the past." England captain Harry Kane also backed Rice, saying: "I can tell just by being with him for a couple of days he will give everything for his country."